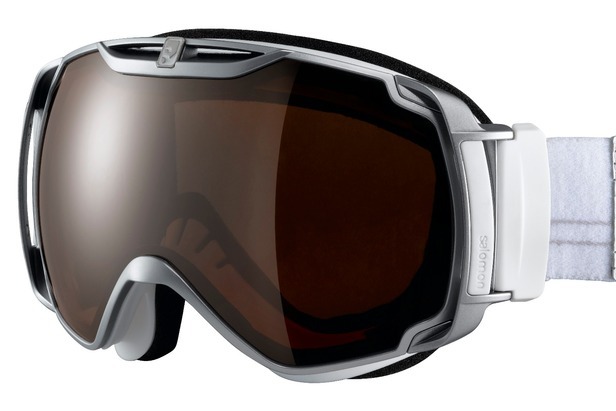 Salomon has created a completely new line of high-performance goggles called X-Tend. All 13 X-Tend models feature double-frame construction with three technology patents including: 20 percent greater field of vision with a larger spherical lens surrounded by a narrow frame for a wider periphery; Thermo Control System—large, scoop-shaped air vents that create low pressure zones to draw moisture from the lens and face and eliminate fogging when wearing a beanie or helmet; and Perfect Fit—a flexible membrane between the frame and the face foam that softly adapts to most face shapes. X-Tend goggles are built with a complete range of coatings for every level of light and weather, two families of frames for large or small face shapes, and are priced accordingly.